Gov. 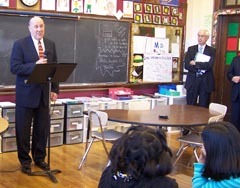 Doyle addresses school children in Madison. The governor is proposing education reforms that could help Wisconsin claim federal stimulus dollars. Changes Governor Doyle would like to make include tying teacher salaries to student performance, allowing classes year-round, and adopting national standards for assessment testing. The Governor also wants to make changes to the school financing formula and revenue caps that would give districts more flexibility with funding. The proposals are part of the state’s application for federal funding under the “Race to the Top” program. Doyle says the reforms will help Wisconsin claim its share of the $4.5 billion available to states under the grant program. Some will require legislative action, while Doyle says the Department of Public Instruction can enact others on its own. The governor plans to submit the state’s application within the next few months.